MUNICH -- Europe's new-car sales fell by 7.8 percent last year with Spain the hardest hit of the big five markets. 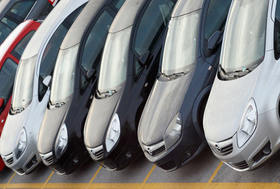 Unit sales in Spain dropped 28.1 percent to 1.16 million cars, according to ACEA, the European carmakers association. The slump was triggered by the country's economic downturn and the end of its construction boom. The other two large European markets - Germany and France - were relatively unaffected. German sales were down 1.8 percent to 3.09 million units. France saw sales dip 0.7 percent to 2.05 million. In central and eastern Europe, Poland overtook Romania as the largest market after sales increased by 9.4 percent to 320,000. Romanian sales fell 8.7 percent to 285,000. European new-car sales in 2008 were at a 15-year low of 14.71 million units, as recession fears saw people hold off big purchases. December was a particularly tough month, with sales across Europe down 17.8 percent to 924,600 units. The month was the second worst of 2008 following the 25.8 percent decrease in November. Among major European manufacturers, Volkswagen posted a 4.4 percent decline in full-year sales, Renault a 6.9 percent drop, PSA/Peugeot-Citroen a fall of 9.1 percent and Fiat a drop of 5.5 percent. Struggling U.S. manufacturers General Motors, Chrysler and Ford saw 2008 European sales fall 13.9 percent, 22.5 percent and 5.2 percent respectively, while Japan's Nissan Motor was a rare gainer, posting sales 8.8 percent higher year-on-year. Analysts expect new-car sales to fall even lower in 2009. J.D. Power Automotive Forecasting cut its 2009 western European auto market forecast by 600,000 units following a bleak December sales month and now sees volumes down 16 percent for the full year to levels last seen in 1993. It expects sales of just 11.39 million vehicles in western Europe in 2009. Double-digit declines are expected in Italy, while Spain will contract by 25 percent and Germany will slide to just 2.75 million units, "a level not seen since the 1980s," the forecaster said. The UK car market is seen plunging "well below" 1.7 million units after 2.13 million in 2008. Only France could see relatively decent demand with J.D. Power anticipating the year would be "somewhat tougher."